Kadampa Buddhism is a special tradition of Mahayana Buddhism founded by Atisha (982-1054 CE), an Indian Buddhist Master largely responsible for the reintroduction of Buddhism into Tibet in the eleventh century. ‘Ka’ refers to all Buddha’s Sutra and Tantra teachings, and ‘dam’ refers to Atisha’s special instructions called the ‘Stages of the Path’, or Lamrim in Tibetan. Kadampa Buddhists integrate their knowledge of all Buddha’s teachings into their everyday lives. The Kadampa Geshes, the followers of Atisha, were not only great scholars but also spiritual practitioners of immense purity and sincerity. The New Kadampa Tradition – International Kadampa Buddhist Union (NKT–IKBU) is an international association of Mahayana Buddhist study and meditation centres that follow the Kadampa Buddhist tradition founded by Venerable Geshe Kelsang Gyatso. These Centers all follow the three New Kadampa Tradition Study Programs (see below) and are guided by a common code of moral discipline called the Internal Rules of the NKT–IKBU. To bring them together under the auspices of a legal entity, every NKT–IKBU Centre is a member of an international Buddhist charity with the same name ‘New Kadampa Tradition – International Kadampa Buddhist Union’. The charity is incorporated in England, and its constitution is completely democratic, sharing authority between a General and Deputy Spiritual Director, a team of managers and the member Centers themselves. At general meetings of the charity, each NKT–IKBU Centre is represented by its Resident Teacher. The NKT–IKBU maintains an ‘International Temples Project’, whose aim is in general to introduce the Buddhist faith of the New Kadampa Tradition publicly, and in particular to exemplify Buddhist practice through public service. Although the lineage Gurus of the NKT from Je Tsongkhapa up to Venerable Geshe Kelsang Gyatso are Tibetan Lamas, the NKT is not Tibetan Buddhism. When the NKT became the International Kadampa Buddhist Union, which is legally registered under English law, it became a legally independent Buddhist tradition. The main reason why NKT–IKBU has chosen to become legally registered as an independent Buddhist tradition is because it was recognized that in Tibetan Buddhism there are so many political problems. These problems are due to the mixing of Dharma and politics, with higher Lamas using the holy Dharma of Buddha’s teachings for political aims. The NKT wants the holy Dharma to be free from these political problems. The purpose of the NKT–IKBU is to preserve and promote the essence of Buddha’s teachings in a form that is suited to the modern world and way of life. Why do we need to study and practice Buddha’s teachings? There are three reasons: to develop our wisdom, to cultivate a good heart, and to maintain a peaceful state of mind. If we do not strive to develop our wisdom we will always remain ignorant of ultimate truth – the true nature of reality. Although we wish for happiness our ignorance leads us to engage in non-virtuous actions, which are the main cause of all our suffering. Also, if we do not cultivate and maintain a good heart our selfish motivation destroys harmony and good relationships with others. We have no inner peace and no chance to gain pure happiness. peaceful states of mind, we can be happy even if our external conditions are bad. Therefore, the development of these qualities is of the utmost importance for our daily happiness, and for our society in general. The lineage of the NKT–IKBU originally came from Buddha, the founder of Buddhism, and was passed down through an unbroken succession of Buddhist Masters to Je Tsongkhapa (1357-1419 CE), who was a manifestation of the Wisdom Buddha. He lived at a time when, although outwardly Buddhism appeared to be flourishing in Tibet, in fact confusion about both doctrine and practice was destroying its spiritual essence. Through teachings and writings of unparalleled clarity and comprehensiveness, an immaculate personal example and tireless energy, Je Tsongkhapa single-handedly revitalized Buddhism in Tibet, giving it a new lease of life that has lasted until the present day. Many qualified practitioners and scholars of all other Tibetan Buddhist traditions respected and deeply appreciated him. 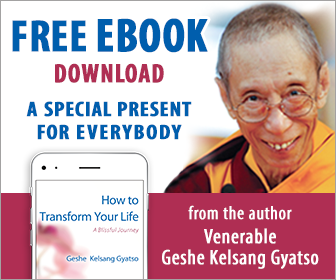 accessible books for beginners to detailed and lucid expositions of the profundities of Buddhist philosophy, Geshe Kelsang’s books form the most comprehensive presentation of the Buddhist path to enlightenment available in any western language. Geshe Kelsang is the only Tibetan Lama to have provided a complete re-presentation of the Buddhist path in accordance with the needs and inclinations of the modern world. Spiritually, all NKT–IKBU Centers follow the same direction and together they constitute the NKT family. What does the NKT teach? Geshe Kelsang has designed three study programs of Buddhist teachings, and all NKT–IKBU Centers offer one or more of these. These programs – called the General, Foundation and Teacher Training Programs – form the very core of the NKT–IKBU, and are what distinguishes the New Kadampa Tradition from other traditions. The General Program(GP) introduces basic Buddhist view, meditation and practice suitable for beginners. It also includes advanced teachings and practices of both Sutra and Tantra for practitioners with greater experience. The Foundation Programme (FP) provides a systematic presentation of particular subjects of Mahayana Buddhism to enable practitioners to deepen their knowledge and experience of Buddhism. The Teacher Training Program (TTP) provides a more extensive presentation of particular subjects of Mahayana Buddhism to enable practitioners to deepen their knowledge and experience of Buddhism, and to train as qualified New Kadampa Tradition Teachers. The Program comprises twelve subjects, based on Buddha’s Sutra and Tantra teachings and the corresponding commentaries by Geshe Kelsang. Participants also need to observe certain commitments with regard to behavior and way of life, and to complete a number of meditation retreats. ‘Geshe’ generally means ‘Virtuous Friend’. Venerable Geshe Kelsang Gyatso studied Geshe training for many years, first in his local monastery called Jampa Ling and then at Tashi Lhunpo Monastic University; and he passed two examinations at that time. One examination was in memorization and the other was the actual examination. Shortly after that people publicly began to address him as ‘Geshe’. Later he joined Sera Je Monastery near Lhasa, where he engaged in further Geshe training studies. After that, in India he mainly emphasized retreat for meditation purposes. While living in the mountains near Dalhousie in northern India he received a letter from Sera Je Monastery in south India, encouraging him to go there for examination. He did not attend at that time because he had heard that a newly created system of examination had been introduced and he did not accept this new system. However, in 1973 he did attend his Geshe Ceremony in Sera Je Monastery, making extensive offerings to thousands of monks and receiving a special traditional ‘khatag’ indicating that he was recognized as a Geshe. Generally, for someone to become an actual Geshe, the Dalai Lama’s recognition is not necessary. Before the Dalai Lamas, many pure and real Geshes appeared, such as Geshe Potowa, Geshe Jayulwa, Geshe Langri Tangpa, Geshe Sharawa and Geshe Chekhawa. 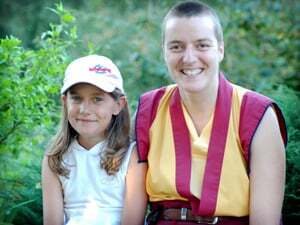 These Kadampa Geshes had no connection with the Dalai Lama. Geshe Kelsang has no connection with the Dalai Lama but is still a pure and real Geshe. The NKT practises the prayer of the Protector Deity Dorje Shugden. This practice is nearly four hundred years old. The first prayer practice of Dorje Shugden, called ‘Lhundrup Döma’, was written by the Fifth Dalai Lama. Later many Lamas of the Sakya and Gelug traditions including Kyabje Trijang Rinpoche, the Spiritual Guide of the present Dalai Lama, wrote other praises and practice prayers for Dorje Shugden. All these prayers reveal that Dorje Shugden is an enlightened Buddha. Some people claim that the Fifth Dalai Lama and a Gelugpa Lama called Ngawang Chogden rejected the Shugden practice, but this is false. There is no evidence to prove this claim, and there is not a single valid reason for saying that Dorje Shugden practitioners are a cult. The NKT−IKBU studies and practises its own tradition purely but sincerely respects all other spiritual traditions. In the past, one NKT Resident Teacher taught his students in a study program class, ‘You should not read books other than those by Geshe Kelsang’. This Teacher’s motivation was to help his students to pass their program examinations by preventing distractions or confusion arising from reading other books. But this is not an NKT rule – NKT people of course have choice about which books they read. This Teacher’s advice was not from a sectarian attitude – he was only trying to help the students to pass their examinations. At the present time the NKT–IKBU has about 700 ordained monks and nuns around the world. The way of granting ordination within the NKT tradition was designed by Geshe Kelsang Gyatso following the ancient Kadampa tradition. It is very simple and very practical. In this tradition, Vinaya – Buddha’s teachings on controlling the mind – is Lamrim, the Stages of the Path to Enlightenment, which belongs to the Mahayana tradition. This is therefore an uncommon tradition. According to the common tradition the Vinaya belongs to the Hinayana tradition; this is not easy for modern day practitioners to put into practice because it has so many rules about physical behavior. For this reason, Geshe Kelsang has presented the NKT way of granting ordination. People of course have choice as to which tradition to follow for their ordination, but someone wishing to be an NKT monk or nun should follow the NKT tradition. Within the NKT–IKBU, the General Spiritual Director has the authority whether or not to accept requests to grant ordination if people ask him or her to do so. He or she will not grant ordination to anyone unless they sincerely request ordination from their own side, and unless they have received permission from their parents and so forth. Also, he or she will not accept requests for ordination from people who are under eighteen years old, and will usually encourage young people to wait until they are twenty-two years old. From the time they become ordained, all monks and nuns need to respect their commitments. If any ordained person in the NKT–IKBU breaks their vows then they must leave their Dharma Center and study program for at least one year. After that they may return, but thereafter cannot become an NKT Dharma Teacher. This rule has been adopted only to protect the purity of holy Dharma, to prevent ordination from being broken in the future, and to save people’s faith. Where are NKT Dharma Centers found? According to the 2007 edition of the NKT–IKBU Directory of Kadampa Buddhist Centers and Branches there are about 1,100 main NKT Centers and branches worldwide. In the UK there are presently 47 Dharma Centers, all of which are registered charities, and about 320 branches of these Centers. All NKT Centers are listed in the NKT–IKBU Directory, which is updated each year. A database of Centers is also maintained on the NKT–IKBU website. Who can join the NKT–IKBU? If someone has a wish to study on any of the three NKT study programmes then he or she can join; there is no discrimination, and everyone is welcome. How do NKT practitioners live? Students of NKT Dharma Centers can either live in their Centre if it is residential, or live independently in their own accommodation. People have complete choice about this. NKT students must support themselves financially in the normal way. How is the NKT financed? Fees are charged by NKT Centers and their branches for drop-in classes, and for all other courses and retreats; and in residential Centers rent is charged for accommodation. In accordance with NKT Center constitutions, none of the income or property of any Center may be paid by way of profit to its Directors, staff, Teachers or Members, or to any other individual person. Every year at the NKT–IKBU International Spring and Summer Festivals at Manjushri KMC in the UK, people gather together from around the world to attend teachings and meditation sessions. There are also Festivals and Dharma Celebrations in many other countries around the world. These events are regarded as spiritual holidays, where people can take a break from their normal routine to study and practice in a special relaxed environment. Surplus profits from these Festivals and Dharma Celebrations, from the publishing departments (Tharpa Publications), from the Dharma Centers – in particular the Kadampa Meditation Centers and International Retreat Centers – and Hotel Kadampas, are all donated toward the development of the NKT–IKBU International Temples Project, for public service only; and in the future all such funds will continue to be donated for the same purpose.